After having a wonderful vacation in Florida last week we had to re-schedule our flight home because our little guy came down with a nasty stomach bug the day before we were supposed to leave. When we got home kiddo #2 came down with it the next night. Needless to say I've been a bit distracted from my blog lately. After a week of cleaning up er, well... yucky stuff I've had a chance to check out all my party participants projects and choose my features. 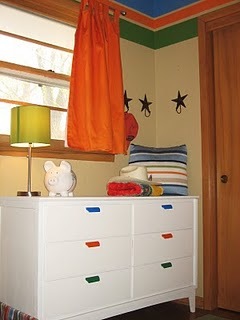 From Party #2 All Doll'ed Up refurbished an out of style dresser and turned it into this... Love it!! My feature from Party #3 is a simple monogram from Froufrou Britches that anyone can do... even if you are one of the few people on Earth, like me, who don't own a cricut! So cute! We came down with the same stomach bug! Our entire family was hit hard. I'm still getting caught up on the *yucky* laundry! This is my first time to attend your party! Blessings as you make your home! 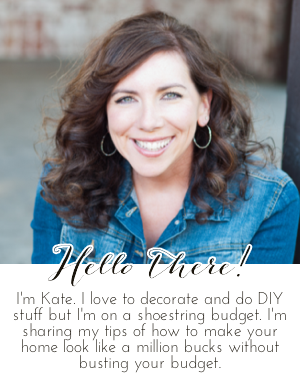 Thanks Kate for featuring my Floating Initial. Thanks for hosting too! Have a great day! Hope your babies are feeling better! I was so excited to see the dresser on flaunt it friday! Thank you so much! I love sharing all the idea and craft goodness! Hope you are well now.. and wishing you lived closer... for when I put my house on the market! Just found your blog from Allison @ House of Hepworths. I linked up a couple of my recent projects and I'm now following you. Thanks for hosting! I found your party through HOH, thank you for hosting! Looks like a fun party -- I will add this to the list of my link parties, and will participate whenever I have something to show for the week!